On Saturday around lunchtime, hungry customers wait for their empanadas outside a small storefront at 16th and South Van Ness. The smell of freshly baked dough mixes comfortably with a soulful voice coming from the speakers on Paula Tejeda’s laptop. Not long after the music starts playing, the person behind the voice appears at Tejeda’s empanada shop, Chile Lindo. Catalina Claro and Tejeda greet each other warmly with hugs, kisses, and quick Spanish exchanges. Claro, a Chilean singer and pianist, has just flown in from France, where she was on the European leg of her tour. In almost an instant, the small shop becomes more like a music producer’s office as the two energetically go over promotional materials for Claro’s three shows this coming weekend. “Perfecto,” Tejeda exclaims as they tape up an ad in the front window. Many know Tejeda as “The Girl from Empanada,” or the woman with the basket full of empanadas sold door to door on Valencia Street for years. What they may not know is that she is also looking to build the Chile Lindo brand. Producing shows and events with a Chilean slant is part of this larger plan. “It’s the bigger vision that keeps me going on the daily grind,” Tejeda says. Right now that path means bringing to the Bay Area, the Chilean artists from the country where she spent many years and where her parents were born. By Monday night, Tejeda is at the San Francisco’s War Memorial Opera House for the Golden Gate Business Association’s 40th Anniversary Party where Claro will sing a few of her songs. Tejeda sees it as an opportunity to promote the upcoming shows. An added bonus: a photo op with Mayor Lee who will be arriving mid-way through the event. In the meantime, Tejeda works the room like a pro and still manages to make a Happy Birthday call to a friend. As she moves through the room, “Hello, Darling!” is followed by a quick hug and kiss on the cheek. “One of my many jobs,” she adds and turns to consult with the jazz ensemble she has recruited and has known for years. She is their boss tonight and she makes it clear to them that her expectations are high. Then she pulls a brown paper bag out of her purse. “I’m sure you’ll get hungry,” she says handing them the empanadas. Danny Grewen, who plays trombone and sings in the jazz group Second Suns, remembers first meeting Tejeda in the early 2000s when he performed at Bruno’s on Mission Street. Tejeda lived around the corner and always make an effort to show up. When life got rough, they shipped their daughter to Chile to live with grandparents. Nevertheless, she always returned, and by the 1980s, Tejeda made the Bay Area her home base. When she and her former husband heard in 1995 that the previous Chilean owner (Tejeda is the third) of Chile Lindo would sell the business to a Cuban, they stepped in and bought it. Five years later, the business started to thrive, but the marriage fell apart. Tejeda continued on her own but decided to sublet the store in 2003 while she returned to school to study Spanish and Spanish-American Studies. After graduating from Mills College in 2008 with the Gabriela Mistral Prize – one named after the first Latin American woman to receive the Nobel Prize for Literature – she decided to return to her empanada business and sell them door-to-door. “Wherever there were people, I was there,” she says. But she kept going and built her brand, joining Twitter and reveling in her press exposure. “I became the iconic girl from empanada,” she says. But there was also trouble. 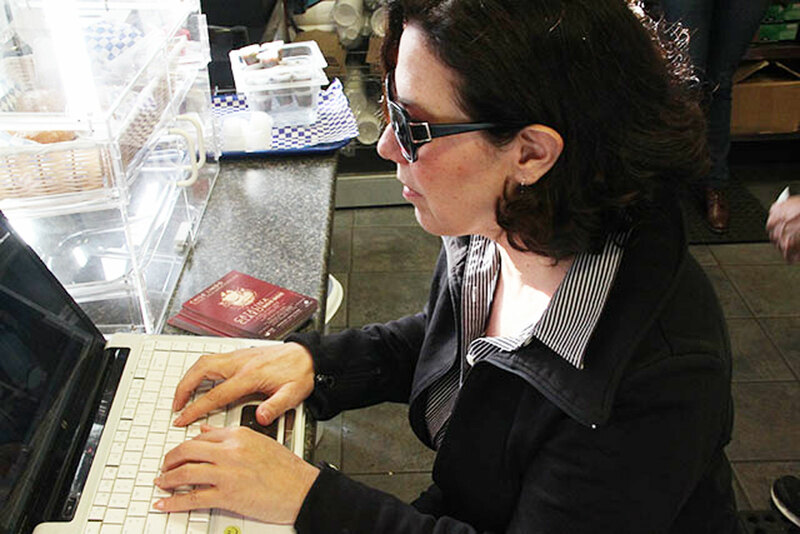 When she opened the current storefront in January of 2010, she got hit with an ADA compliance suit. That solved, she soon confronted an eviction notice at her own home, but she’s managed to beat that as well. It’s classic Tejeda – endlessly upbeat and ambitious. This week, however, the Dean and Deluca empire can wait. On Monday, it is the mayor she’s after. Ah, there he is. She gets her photo and the next day sends out an e-mail with the subject line, “A San Francisco Welcome for Catalina Claro.” And, it is. 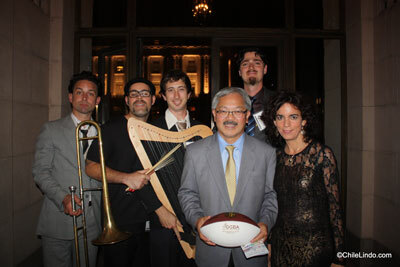 The band, Claro and Mayor Ed Lee are all there. PreviousGood Morning Mission! Rain or Shine! Andra Cernavskis is a student at UC Berkeley's Graduate School of Journalism. She is Canadian by birth but grew up in New Jersey and then San Francisco's Miraloma neighborhood. She has also spent time in Toronto, Buffalo, and Montreal. The Mission is one of her favorite neighborhoods, and she is thrilled to be back reporting in San Francisco. That would be a very good piece of journalism. Even across the city where a lot of small mom and pop businesses get hurt by ADA lawsuits.